The stories and instruction in the Old Testament book of Exodus seem more at home in a museum than in today's world. Yet, for the apostle Paul, the Old Testament is 'written for us': hence, reading Exodus as direct address is the appropriate Christian stance. ^This volume, based on the 2007 Moore College School of Theology, acknowledges that reading Exodus for all its worth, as a witness to the gospel and as wisdom for Christian living, is an enormous challenge. The book's appeal for today is unmistakable, in terms of its epic scope and moral complexity. ^^The opening chapter surveys the 'uses, re-uses and misuses' of Exodus in contemporary culture, and exhorts us to feel the book's raw power, by facing squarely its moral challenges and being shaped by its sometimes bewildering theology. ^^In response, subsequent chapters explore major units of the text and the main theological and ethical issues that they raise. Topics covered are the exodus event itself; its significance in contemporary theologies of liberation; Moses at Sinai; the Law in Exodus; the tabernacle; and how we should preach Exodus. The contributors are Greg Clark, George Athas, Michael Raiter, Paul Williamson, Andrew Cameron, Barry Webb, Constantine Campbell and Richard Gibson. About "Exploring Exodus: Literary, Theological and Contemporary Approaches"
Brian S. Rosner (Ph.D., University of Cambridge) is senior lecturer in New Testament and ethics at Moore Theological College, and Honorary Senior Research Fellow in Ancient History at Macquarie University, Australia. He is the author and editor of a number of books, including Paul, Scripture and Ethics: A Study of 1 Corinthians 5-7. ( Arbeiten zur Geschichte des Antiken Judentums und des Urchristentums 22. E.J. Brill, 1994. ); How to get really Rich: A Sharp Look at the Religion of Greed. (Leicester: IVP, 1999. );Beyond Greed. (Matthias Press, 2004. ); Greed is Idolatry: The Origin and Meaning of a Pauline Metaphor (Eerdmans, 2006), and 1 Corinthians (Pillar New Testament Commentary) with Roy Ciampa. Paul R. Williamson (Ph.D., The Queen's University, Belfast ) is Lecturer in Old Testament and Hebrew at Moore Theological College, Sydney, Australia. He is the author of Abraham, Israel and the Nations and Sealed with an Oath (New Studies In Biblical Theology), and a contributor to The Land of Promise, the New Dictionary of Biblical Theology and volumes in the Dictionary of the Old Testament. Dr Williamson is preparing the forthcoming volumes on Exodus (Tyndale Old Testament Commentary) and The Book of Exodus (Reading the Bible Today Series). 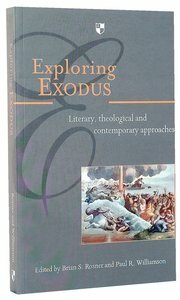 Customer Reviews For "Exploring Exodus: Literary, Theological and Contemporary Approaches"
This book does a good job of providing a broad range of essays that introduce readers to some of main themes and challenges of the book of Exodus. Those teaching Exodus would certainly be helped by reading these essays as part of their preparation alongside a thorough commentary on the text itself.